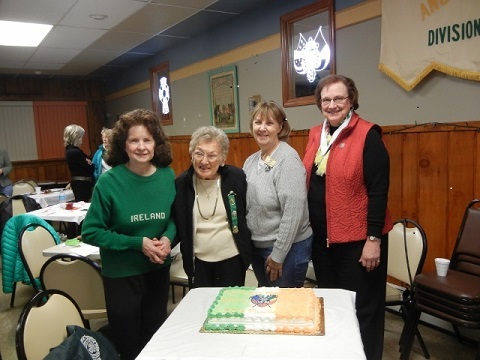 Pictured above L-R: Dorothy Flaherty Weldon, Past National President; Marge Visokey, Division 4; Colleen Bowers, National Fundraiser/Past State President; and Shirley Murphy, Pennsylvania State Irish Historian; awarded Marge the National Lifetime Membership for 70 years of LAOH service at the Allegheny County LAOH General County Meeting Saturday, November 14. Allegheny County Board members present were Kathleen Diulus, President; Eileen O’Malley, Vice President; Secretary & Immediate Past President, Sharon McGrath; Treasurer, Sue Donnelly; Catholic Action, Kathleen Toomey; Freedom for All Ireland, Shirley Sestric; Immigration and Legislation, Suzanne Heller ; and Publicity/Webmaster Lori Butler. Cake, refreshments and lively conversation followed afterwards.